TODAY WE ARE GETTING THE FIRST SNOW OF WINTER! Yes, that's right, it has taken until January for Missouri to get a real, sticking snow. I'm VERY happy about it. I feel winter is a waste of time if it doesn't snow. Who likes cold that doesn't provide snow days or outdoor fun? 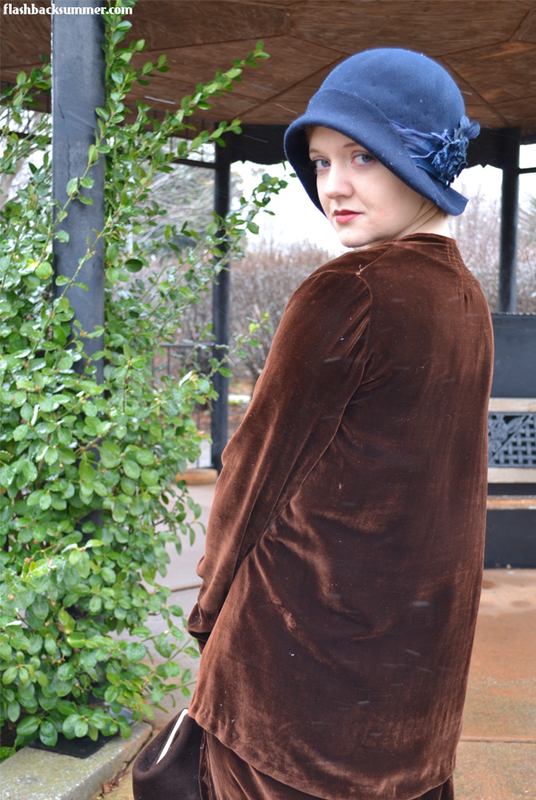 Anyway, I also just finished altering this 1920s suit I bought a while ago. It was my first 1920s piece, and it had been lengthened and widened at some point in the past. (I believe it was an old alteration, probably done in the 1920s. It kept the boxy 20s silhouette, and the added fabric is extremely close to the original.) I took out the lengthening panel at the waist to make it short enough for me again, and it now fits! I feel very Coco Chanel in it, but I obviously need to get myself a long string of pearls to complete the look. 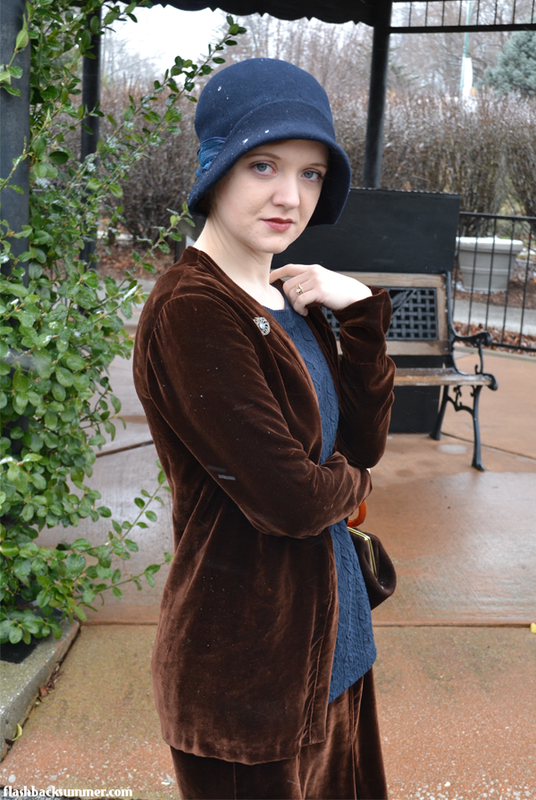 I also felt the need for a hat (hats being a necessary part of 1920s winter fashion and all), but 1920s hats are extremely expensive and hard to come by. 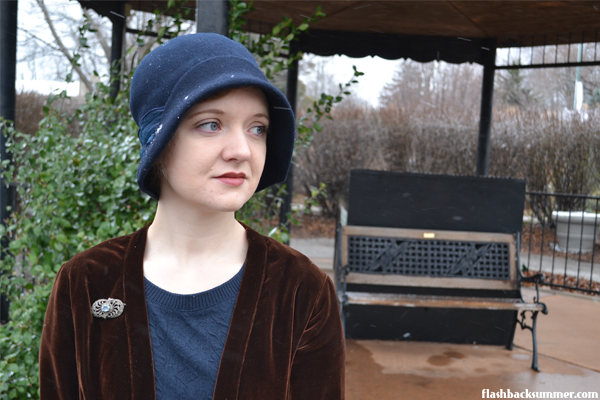 I took a page out of Lauren Stowell's book and re-blocked a hat to make a 1920s cloche. I don't have a hat block, and I took a very... make-do... questionable route to get to this cloche. (Including putting the hat on my husband's head and steaming it into shape. He's a good husband.) I reused the embellishments that were on the modern hat and sewed them on. I think it's pretty good for a first try ever! 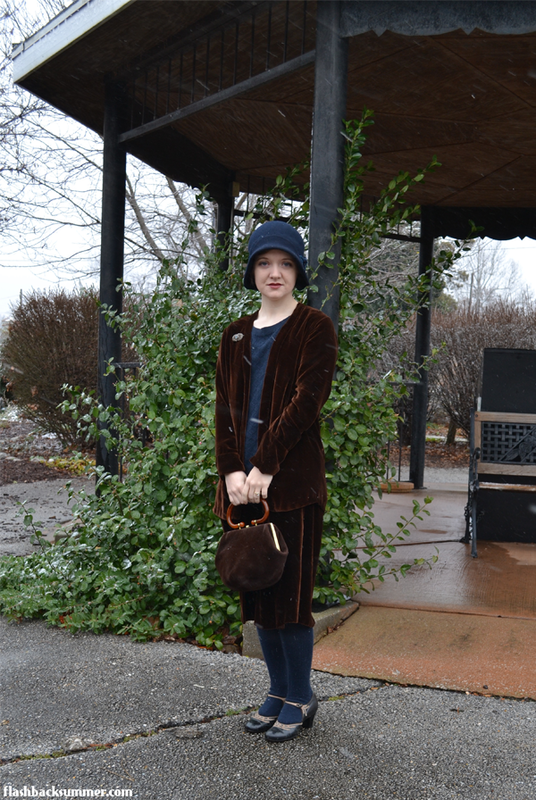 I paired the outfit with one of my only longer-length shirts, some thigh-high socks, a "1928" brand brooch from the 1980s, and my 1920s shoes. I used things I already had in my closet, and I'm proud of that! I'm trying to do less buying and more making-do-and-mending this year. I'm also proud of how far I've come in my knowledge of vintage styles. A very long time ago I posted a "1920s photo shoot" post that I now realize.... was very not 1920s. 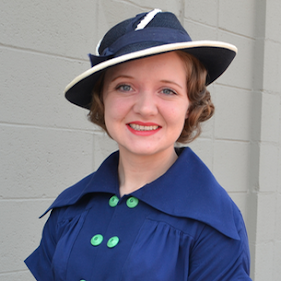 My hair and shoes were close, but the dress wasn't even remotely near an actually 1920s look. Even though it's kind of an embarrassing post, it's nice to have photographic evidence of my vintage knowledge growth in the past couple years! What area of your vintage knowledge has grown a lot recently? Is there something you're especially proud of accomplishing or learning? If you want more 1920s inspiration, here are some things you may like! I love this outfit!! Good job on altering the dress - it looks nice and warm and I'm rather jealous! And well done on making your own cloche - I wouldn't even attempt it ahhaha well done Em!! Oh how I LOVE everything about this Emileigh! That suit is absolutely fabulous and the velvet color so delightful. I am also super impressed with the cloche hat you made because it is absolutely spot on. 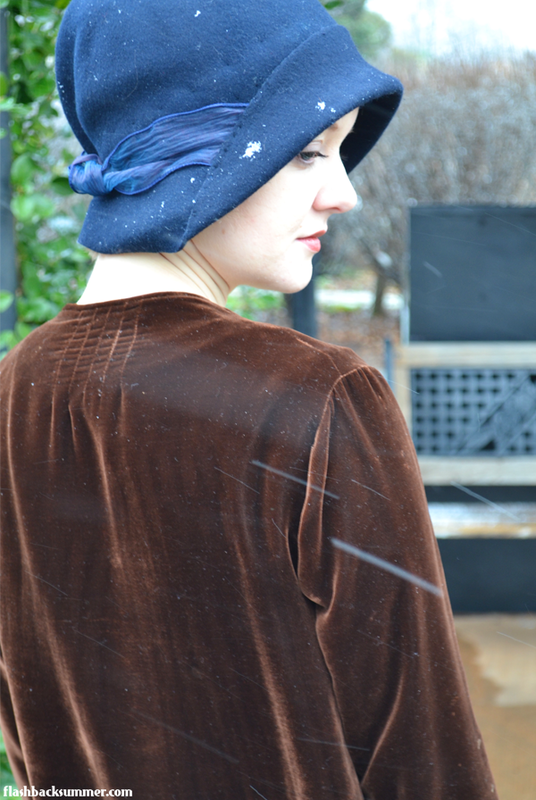 This ensemble is so perfectly 20's! I love this entire outfit. It looks so chic and elegant on you. Love how you reworked he hat, aren't patient husbands the best? Wow this ere suits you well! Amazing job on the hat! You clearly have a natural talent for the millinery arts, sweet gal. This whole ensemble is elegant, beautiful and incredibly becoming. 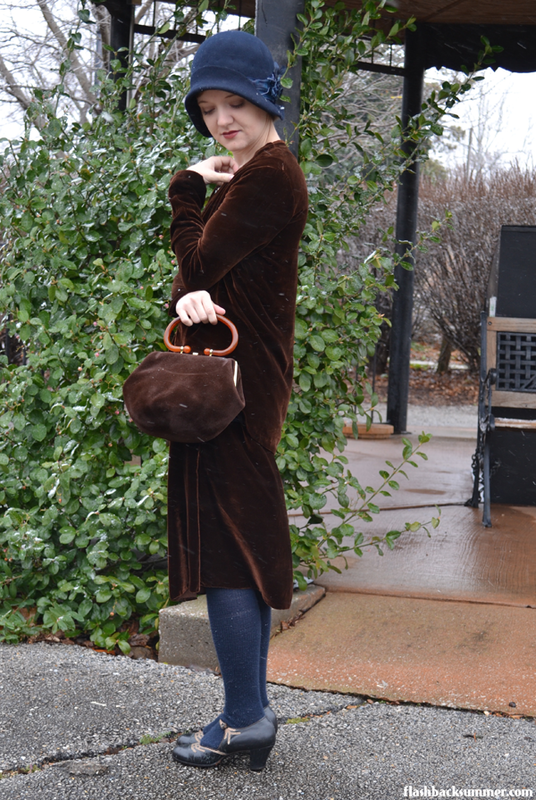 Much like the 1930s, the 20s look incredible on you! You did really well on the hat - the shape it just perfect! I agree with Lauren that wool hats are worth saving and reshaping - and it's so much fun. 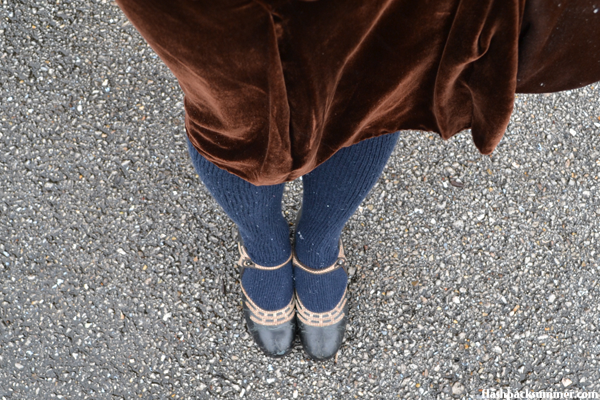 The outfit is stunning too and I love blue and brown together! Are those stitch marks from the original trim placement? You can try getting them out by steaming and roughing up the area (I use the open blades of scissors, but I believe emery boards are also used) which helps close the hole and move fibres across it as well. I have some pretty embarrassing interpretations of various decades in my creative past, and I'm sure I'll be embarrassed about some of the current attempts one day! Hey Tanith, thank you so much! Stitch wise, on the outside, insert the needle back into the same point where it emerged, but at an angle, which is about as invisible as you can get with felt. Also, you might still get a benefit from holding that area back in some steam (carefully, so you don't mess up your earlier blocking). The felt will kind of expand into the stitch marks (maybe) - this usually works with any pin holes et. I wouldn't risk the scissor treatment with stitches there but a gentle rub with your fingertips after steaming could help too. Fantastic! Well done with the hat! Before I read you'd re-blocked it, I thought it was original 1920s! WOW, that is such a huge compliment!!! That has made my day. Thanks, Lauren! Fabulous suit! Fabulous hat! Fabulous shoes! I could go on and on. One thing you don't mention is the bag, is it original? It goes perfectly with the suit. Ha, I totally forgot the bag! It's vintage and is brown velvet with a plastic handle of some sort. I'm not sure how old it is, but my guess is the 1950s, maybe 40s? It's a pretty classic style, so I'm not 100% sure. Velvet is one of my favorites, too! I LOVE IT. Thanks for the kind words! As I recently learned, glass beads that are "pearls" are a really comparable weight to pearl beads. Because a cheap beaded necklace always hangs like plastic (cause it is!) and the weight and temperature of the glass beads really feels accurate. And when beading you could either just string them plain, or do the little tiny knots in between. Warning, because the pearl coating on glass beads is painted on, you might not be able to get a needle through all of the holes, so overbuy. I cracked a few trying to bead a necklace for my niece, because the holes were paint filled. Its the most satisfying craft. AND you can get them in any color you'd like! 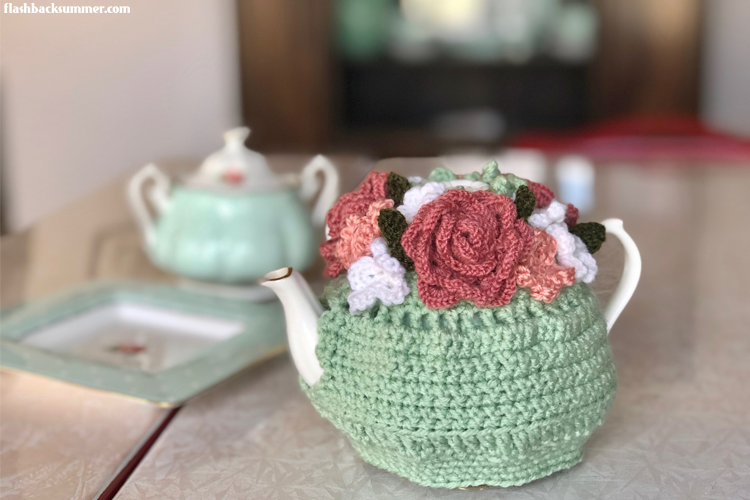 Obviously, cream is the most natural, but pearls come in many colors. Gorgeous suit. 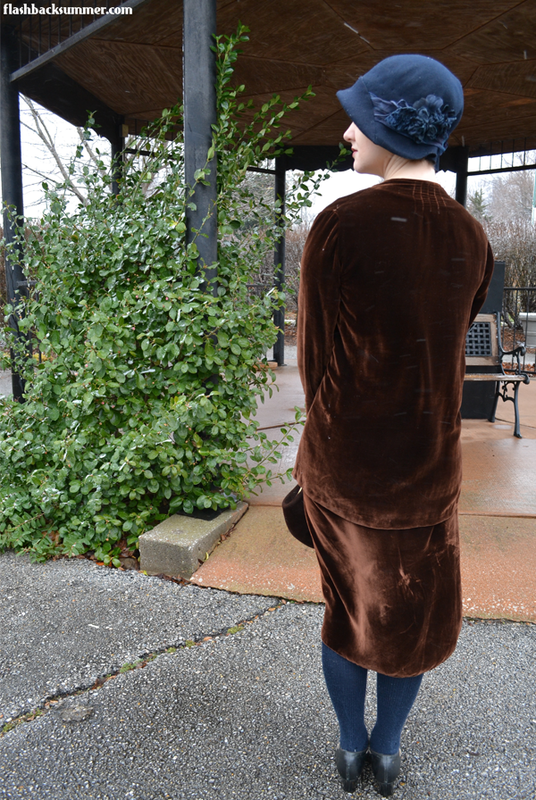 I love the velvet. I love the styling. I love WARM 20s fashion (which is rarely represented). You look awesome. Such a lovely suit, it looks fabulous on you. Great job on the hat too! Love the whole ensemble, but the hat remake is remarkable. Fab! This is truly stunning. 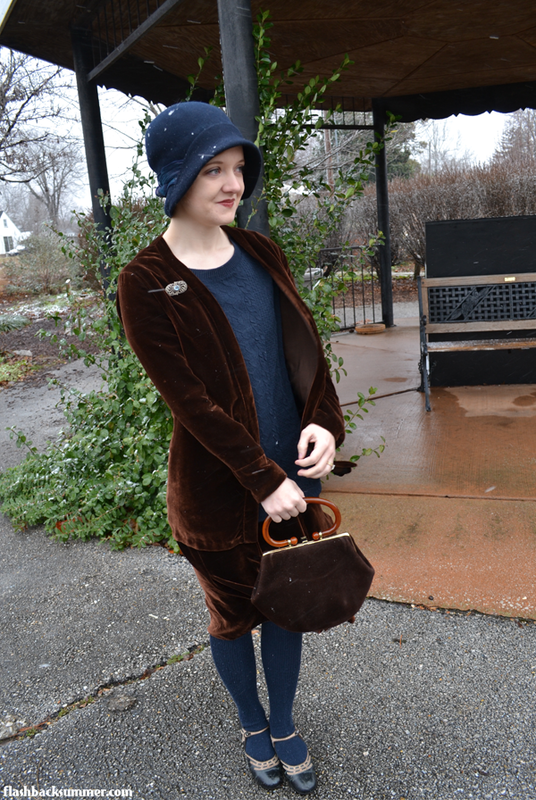 I love the bronze velvet and the deep blue together, and I'm frankly amazed by that hat. You should dip into the 20s more often, because it's perfectly suited to you. Aw, thanks Jessica! I do hope to dip into the 20s a bit more this year! 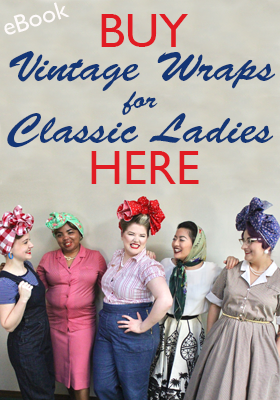 Introducing... Clap for that Wrap Style Series!